For a limited time only, receive the RUPES TA50 Mini Random Orbital Sander Replacement Backing Plate FREE with your purchase! That's a total of TWO Backing Plates! Polish and sand small, intricate body panels with this 2 inch mini sander! The Rupes TA50 Mini Random Orbital Sander solves the problem that plagues nearly all professional detailers and body shops – polishing and sanding small, intricate body panels. If you’ve found that your 3 inch polisher simply isn’t small enough, the Rupes TA50 Mini Random Orbital Sander and its 2 inch footprint will make this tool an asset in every detail. The Rupes TA50 Mini Random Orbital Sander is manufactured in Italy to the highest quality standards. As the design of modern cars becomes more complicated, the body panels have more convex and concave designs, making it nearly impossible to properly sand or polish the surface. Rupes, a pioneer in the paint refinishing industry, developed a solution – the TA50 Mini Random Orbital Sander. The Rupes TA50 Mini Random Orbital Sander is a quality piece of equipment that is built to last. Designed to be used with an air compressor, the Rupes TA50 Mini Random Orbital Sander spins at up to 15,000 RPM! Weighing in at less than 2 pounds, the Rupes TA50 Mini Random Orbital Sander minimizes user fatigue, even after long detailing sessions. The Rupes TA50 Mini Random Orbital Sander is a must-have detailing tool for any detail shop or body shop that takes their work seriously. 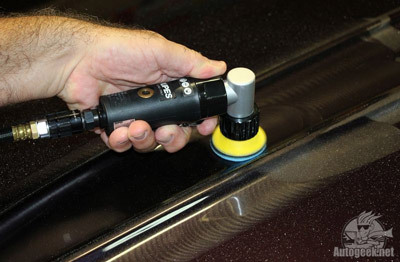 Use the Rupes TA50 Mini Random Orbital Sander on a-pillars, complex body panels, wheels, bumpers, and more! The slim body combined with the excellent ergonomics ensures drama-free polishing, even for inexperienced users.